8 Times You’ve Had a Psychic Experience… Without Even Knowing It! I have some potentially mind blowing information for you! Ready? You have had a psychic experience (or multiple experiences) — without even realizing it. See, psychic experiences don’t have to involve a crystal balls, cards, or a long robe and fancy hat. Quite the opposite, in fact (which my wardrobe is pretty happy about). There are moments that all of us have lived through that indicate a psychic experience. Don’t believe me? That’s okay. Let’s chat! Have You Had These Psychic Experiences? One thing that most people don’t understand about psychic ability is that it’s subtle. Think: A whisper in the wind, NOT a full-blown orchestra. Now, take a few minutes and a deep breath and ask yourself the following questions. They will help you know for sure if some of the experiences you’ve been having are psychic experiences. 1. Felt like something was going to happen before it did? I specifically remember a conversation between my parents a long time ago (I’m talking Brady Bunch days). The evidence did not support that thought (it was two weeks before Christmas – a time when no companies make a big move), but he kept reiterating his feelings. Sure enough, two days later, the company let 60% of their team members go. No warning, no indication, but somehow, dad just knew. 2. Been guided to do something that kept you from harm? Have you ever had that moment of, “uh, I better not”. Maybe it was choosing to not go out with your friends that night. Or, deciding not to get in that Uber or friend’s car. Call it being overly cautious or safe, but there is most likely a deeper reason you felt that tug. There was a time I pulled up to a gas station. Something about it felt off but I really didn’t think anything of it. The cashier took my money and sent me on my way. But before I could fill up, a car pulled up and two guys got out and walked into the store. Something really felt off then and I ended up leaving. It seemed completely illogical at the time — I was actually frustrated with myself. But, it turns out those guys ended up robbing the store. They didn’t hurt anyone or get but a few miles down the road, but nonetheless. I just “felt” it. 3. Sensed that someone was watching you? Slowly, you turn around and see someone staring right at you! You know exactly what I mean, right? This psychic experience has happened to almost everyone. You get that feeling that someone’s eyes are on you. And sure enough, they are! 4. Dreamed about something that later came true? This is one of my all time favorite psychic experiences. Dreams! I used to have a co-worker who interpreted dreams and we would get caught up all day at lunch chatting about all the different things they can mean. She told me of a time when her mom woke up at 3 am in a panic. She needed to call her sister right then and there — something was wrong. The whole family tried to calm her down and get her back to bed. It turns out, her dream was that her sister’s husband had a heart attack — and that’s exactly what had happened when! 5. Had a deceased loved one visit you in a dream? FYI, dreaming of Spirits is not scary or creepy at all. True Spirit visits are actually one way our loved ones in heaven continue to connect with us from the afterlife. When we are sleeping, our logical minds rest and sort of “get out of the way”. This makes it easier for our loved ones in heaven to connect with us. Read: Was it a Spirit Visit or Just a Dream? 6. Just known that someone wasn’t trustworthy? Unfortunately, not everyone’s intentions are good. It would be fantastic if they were, but that’s not the case. There have been multiple times in both my business and personal life that I sensed someone’s intentions were anything but good — and I was right. Maybe it’s a coworker who seems super sweet, but you sense something different when she’s around. Or, maybe it’s someone you’re doing business with (selling/buying products online, etc). Pay close attention to these psychic vibes… they’re usually right! 7. Had a dream (or thought about) someone you haven’t heard from in a long time? Then suddenly – you hear from them out of the blue? Or run into them at the grocery store? 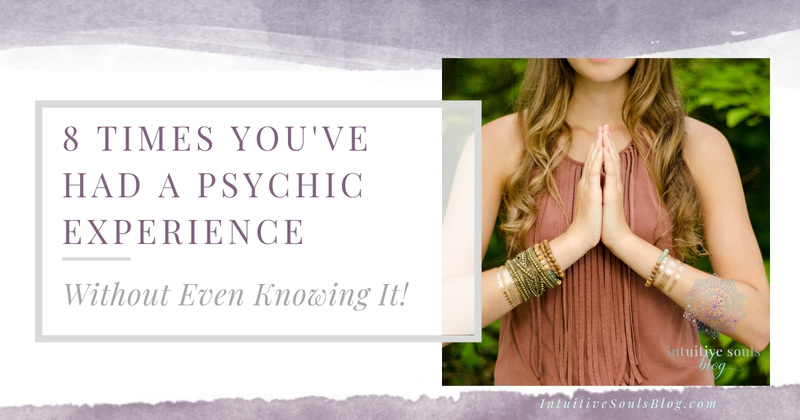 If this psychic experience has happened to you, I bet you didn’t ignore it! Some things can be easily explained away or made to look like “imagination or coincidences”. But psychic experiences like this are just too cool and too awesome to be ignored! Tip: There is obviously a reason you two need to be in contact — so enjoy it! 8. Seen flashes of light out of the corner of your eye? Sometimes these flashes will be enormous. Other times, they will look like twinkling lights. Or, it will look like pixie dust floating in the air! Don’t let this moment pass by without taking note! I love the warm feeling of knowing that my angels are around me or that a spirit is coming to visit. If your logical mind is trying to tell you the flash was just your lamp, here’s a good rule of thumb: if you feel it, it’s probably true. I mean really feel it. You just know. Don’t let yourself get talked out of it! Smile and enjoy their presence. Take comfort that angels in heaven are here to comfort you. In each of the examples above, you were nudged in the form of a sense, vision, or feeling to inform you of something important. People of all races, religions and socio-economic backgrounds have been down the same path. In fact, many of the world’s most famous and successful people acknowledge their intuition or gut instinct as the reason for their success! If you’re ready to get cozy with your psychic abilities, check out these 28 psychic development tips.